Family Matters : Newly Remodeled Living Area/Pool/Outdoor Kitchen, Elevator, Huge Private Pool, and Close to Beach! A Completely New Outdoor Living Space Is Coming to Family Matters! “Family Matters” is the perfect coastal retreat for a large group of friends and family that are looking for luxury and comfort. 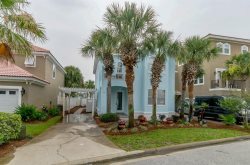 This home is located less than one block away from the beach! This is one of the few homes in the area that also includes an outdoor playset for the kids and features a private pool with LED lighting! “Family Matters” has everything you need for the perfect vacation at the beach. “Family Matters” is a 9 bedroom, 5.5 bath, luxury home with nearly 5,000 sq.ft of total living space. There is approximately 4,200 sq.ft of interior space and nearly 800 sq.ft of covered patios and balconies. The home sleeps 20 in beds and up to 22 with sofa sleeper. For convenience, this home also offers an elevator with access to all three floors! On the first floor you will find a high-end gourmet kitchen with top of the line appliances; comfortable dining arrangements for all of your guests including a large formal dining room table; a breakfast nook table; and a large granite bar stool counter adjacent to the kitchen. The Master King Suite is spectacular and features a beautiful master bath and doors opening to your private with comfortable seating and a west-facing view over the Gulf of Mexico. There is an additional half bath near the common entertaining area. Taking the elevator or stairs up to the second floor, you will find a secluded sitting room perfect for a second gathering area or for a quiet moment reading or napping on the queen sleeper sofa. Also on this level are 4 King Suites, 2 large bathrooms, a separate laundry room, and a fun bunk with two sets of twin-over-twin bunk beds which sleep 4 guests. The third floor Master King Suite is well-worthy of a home of this caliber. There is a beautiful trey ceiling, elegant crown molding, and a top-end electronics suite. This room opens up to a large private balcony providing lovely views over Crystal Beach and the Gulf of Mexico. The bathroom is akin to a spa with a large garden tub; separate shower area; spacious dressing area; and a laundry nook with a second washer and dryer set. The third floor also has 2 additional King Suites and a bathroom with direct access from both rooms. The property is situated in the perfect location only 200 yards to beach access on the quiet and un-crowded western end of Scenic Gulf Drive. The home is a few lots off of Scenic Gulf Drive, ensuring that there will never be a problem with traffic or pedestrian noise. The Crystal Beach neighborhood is Destin’s best beach area and is a short distance from Destin’s best shopping and dining locations. *This home rents only Saturday to Saturday during Spring Break and Summer months. Please call our office if you have any questions at (850) 650-4544. Seasonal Beach Chair Service - Our complimentary seasonal beach service is offered for our Spring and Summer 2019 months. This includes 4 chairs and 2 umbrellas set up daily on the beach from 9am-5pm. Our Season begins on March 2, 2019 and ends October 31, 2019. *Weddings/Events – If held on property or private beach an additional $500.00 Event Fee is required for permit. *Free beach chair service included from March 2, 2019- October 31,2019. *Includes 2 chairs and 1 umbrellas set up daily. *Free concierge services- our concierge can help you plan the vacation of a lifetime! *All linens and bath towels are provided. Please provide your own beach/pool towels. *Starter set of supplies. We will get you started and you take it from there! *Fully stocked kitchen! It’s like cooking at your own home! This beach house will have everything you need and more. *This home has a beautiful gas grill, which includes propane. *Our concierge can arrange golf, dining, water sports, fishing trips and other services prior to your visit or during your stay.